Draft: 2005, Milwaukee Brewers, 1st rd. Is married.....wife's name is Larisa.....the couple has a daughter, Celine, and son, Greyson ... Graduated from Granada Hills (CA) High School ... Attended the University of Miami (FL), where he was a First-Team Freshman All-American and also named National Freshman of the Year by Baseball America ... Was inducted into the University of Miami Sports Hall of Fame in April 2017 ... Participated in the Hunger Task Force's Thanksgiving food drive each of the past six years ... Helped raise money this past offseason for victims of the California wild fires and bar shooting in Thousand Oaks in November.....co-founded "California Strong," raising over $1.5 million ... Donated $25,000 in 2012 to help build a home in Milwaukee for Habitat for Humanity ... Provided support and served as honorary chair for AIDS Walk Wisconsin in 2012 ... Has donated athletic merchandise from Nike to disadvantaged kids in the Milwaukee area ... Has donated money to the Boys & Girls Clubs of Greater Milwaukee to support the Little Brewers Baseball Club, a statewide youth baseball league for 2,000 kids ... His younger brother, Steve, was an infielder in the Brewers organization from 2008-10 ... Enjoys the beach, water sports, music, movies and cars. Batted .254 with 20 HR, 64 RBI and 11 stolen bases in 125 games ... Made 99 starts (85g in LF, 12g at 1B, 2g at DH) ... Prior to 2018 had never played first base at any level ... Produced his ninth career 20+ HR season ... Tied Jim Gantner (11) for the third-most Opening Day starts in franchise history, trailing only Robin Yount (19) and Paul Molitor (12) ... Gave the Brewers an 8-6 victory on 3/30 at San Diego with a 2-out, 3-run homer in the ninth inning off Brad Hand.....had a season-high 5 RBI in the contest ... Belted his fourth career walk-off homer on 4/3 vs. St. Louis with a solo shot in the ninth inning off Dominic Leone, going back-to-back with Christian Yelich ... Recorded his 1,000th career RBI on 4/19 vs. Miami on a 3-run, pinch-hit homer off Junichi Tazawa.....was the second pinch-hit homer of his career ... Notched his second 5-RBI game of the season in a 12-4 win on 6/8 at Philadelphia ... Was on the 10-day disabled list from 5/17-5/23, retroactive to 5/14, with middle back tightness and from 7/8-7/20 with a back strain (missed 16 games while on the DL) ... Batted .344 (11-for-32) with 5 HR and 12 RBI over his last 10 games ... Batted .286 (12-for-42, 0hr, 4rbi) in 10 games during the postseason. Batted .268 with 17 HR, 52 RBI and 12 stolen bases in 104 games...Made 99 starts (95g in LF, 4g at DH)... Missed 39 games during a pair of disabled list stints with a left calf strain (8g, 5/12-5/20 and 31g, 5/26-6/26).....prior to 2017 had just two career stints on the disabled list (2013 and 2014)...Became just the fourth player in franchise history to make 10+ Opening Day starts, joining Robin Yount (19), Paul Molitor (12) and Jim Gantner (11)...Became the all-time franchise leader in grand slams with his sixth on 7/14 vs. Philadelphia, passing Cecil Cooper, John Jaha and Jeromy Burnitz... Belted his 300th career home run on 9/8 at Chicago-NL with a 2-run shot off John Lackey....is the first player in franchise history to reach that milestone. Batted .305 with 30 HR, 91 RBI and 16 stolen bases in 135 games...Made 130 starts (127g in LF, 3g at DH)...Returned to left field after two seasons in right field (3B: 2007; LF: 2008-13; RF: 2014-15)...Produced his sixth 30+ HR season and seventh 90+ RBI season...Named Brewers Most Valuable Player as voted on by members of the Milwaukee Chapter of the Baseball Writers Association of America.....won for the fourth time (also 2011-12 and 2015)...Was the Brewers' nominee for the Hank Aaron Award and Roberto Clemente Award...Led the team in batting average (.305), total bases (275), slugging pct. (.538) and OPS (.903)...Ranked among the National League leaders in slugging pct. (8th, .538), OPS (9th, .903) and batting average (10th, .305)...Was an All-Star "Final Vote" candidate with 1B Brandon Belt (SF-winner), OF Starling Marte (Pit), SS Trevor Story (Col) and 3B Jake Lamb (Ari)...Recorded career hit #1,500 on 6/7 vs. Oakland with an infield single off Sean Manaea..Tied the franchise record (10x) and his career high (2x) with 7 RBI on 8/6 at Arizona ...Named Brewers Player of the Month for April (.333, 5hr, 18rbi) and August (.283, 10hr, 28rbi). Batted .285 with 25 HR, 84 RBI and 24 stolen bases in 140 games…Made 132 starts (128g in RF, 4g at DH)…Named Brewers Most Valuable Player as voted on by members of the Milwaukee Chapter of the Baseball Writers Association of America.....won the award for the third time (also 2011-12)…Was the Brewers' nominee for the Hank Aaron Award…Led the team in batting average (.285), runs (87) and total bases (252).....tied Jean Segura for the team lead in hits (144)…Ranked among the NL leaders in stolen bases (T8th, 24) and slugging percentage (9th, .498)…Recorded his fourth career 20/20 season.....was one of just four players in the Major Leagues with at least 20 HR and 20 SB in 2015, joining the Diamondbacks' duo of Paul Goldschmidt and A.J. Pollock and the Orioles' Manny Machado…Was selected to his sixth All-Star Game, replacing the Cardinals' Matt Holliday, and notched a pinch-hit triple off the Twins' Glen Perkins (scored)…Became the all-time franchise leader in home runs with #252 coming on 8/19 vs. Miami.....overtook Robin Yount (251) to become the new leader......finished the season with 255 HR…Named NL Co-Player of the Week for 5/17-5/24, along with the Pirates' Andrew McCutchen, after batting .381 (8-for-21) with 3 HR and 11 RBI…Was named Brewers Player of the Month for May (.272, 8hr, 28rbi)…Belted grand slams on 4/29 at Cincinnati and 8/6 vs. Philadelphia.....now has 5 career slams…Batted .342 (41-for-120, 6hr, 21rbi) over his last 33 games.....was shut down for the rest of the season on 9/27 (lower back).....underwent surgery on 10/8, performed by Dr. Robert Watkins. Batted .298 with 9 HR, 38 RBI and 4 stolen bases in 61 games...Made 59 starts, all in left field...Was on the 15-day disabled list from 6/14-7/7 with a right thumb contusion.....was the first disabled list stint of his career (missed 21 games)...Was on the bereavement list from 7/11-7/14 due to a family medical issue (missed 4 games)...Was suspended by Major League Baseball on 7/22 for the remainder of the season (65 games) for violations of the Basic Agreement and its Joint Drug Prevention and Treatment Program...Played in his second World Baseball Classic, batting .280 (7-for-25) with 1 RBI in 6 games. Batted .319 with 41 HR, 112 RBI and 30 stolen bases in 154 games. Made 153 starts (151g in LF, 2g at DH). Was second in National League Most Valuable Player voting behind the Giants' Buster Posey ...ﬁnished in the top three for the third time in his career (won in 2011, third in 2008). Earned his ﬁfth consecutive Silver Slugger Award. Was named Brewers Most Valuable Player for the second straight season as voted on by members of the Milwaukee Chapter of the Baseball Writers Association of America. Was a ﬁnalist for a Gold Glove Award in left ﬁeld for the second straight season along with the Rockies' Carlos Gonzalez (winner) and Braves' Martin Prado. Selected to his ﬁfth All-Star Game ... started for the injured Matt Kemp (2-for-3, 1r, 2b, 3b, 1rbi). Led the National League in home runs (41), total bases (356), runs (108) and OPS (.987) and tied for the league lead in extra-base hits (80) ... was also among the NL leaders in RBI (2nd, 112), hits (2nd, 191), slugging percentage (2nd, .595), batting average (3rd, .319), on-base percentage (4th, .391) and stolen bases (T9th, 30). Had his second straight 30/30 season and just the 11th "40/30" season in Major League history, joining Barry Bonds (1996-97), Jeff Bagwell (1997, '99), Hank Aaron (1963), Jose Canseco (1988), Ellis Burks (1996), Larry Walker (1997), Alex Rodriguez (1998) and Alfonso Soriano (2006). Notched the seventh 40-HR season in franchise history, joining Prince Fielder (2007 and 2009), Richie Sexson (2001 and '03), Gorman Thomas (1979) and Ben Oglivie (1980). Became the ﬁrst player in franchise history to produce ﬁve 100-RBI seasons (2008-12). Joined Prince Fielder (2007-11) as the only players in franchise history with ﬁ ve seasons of 30 or more home runs (2007-09, '11-12). Hit 3 HR on 4/30 at San Diego and tied his career high with 6 RBI in the 8-3 win.....was the ﬁrst 3-homer game in the history of PETCO Park ... became just the sixth player since 1900 to hit 3 HR and a triple in the same game, joining Les Bell (1928), Tony Lazzeri (1936), Pat Sweerey (1948), Wes Westrum (1950) and Fred Lynn (1975). Stole his 100th career base on 5/1 at San Diego to become just the fourth player in franchise history with 100 HR and 100 SB as a Brewer ... joined Robin Yount, Paul Molitor and Rickie Weeks. From 6/5-6/24 recorded an 18-game hitting streak (26-75, .347, 6hr, 16rbi) ... was the longest hitting streak by a Brewer in 2012. His 1,000th career hit came on 7/20 at Cincinnati with a single off Homer Bailey ... tied Juan Pierre as the fourth-fastest active player to reach 1,000 career hits (815th game), trailing only Ichiro Suzuki (696), Derek Jeter (780) and Albert Pujols (806). Belted his 200th career home run on 9/16 vs. New York-NL with a solo shot off Chris Young and became the ﬁfth-fastest active player to 200 career homers (867th game) ... trailed only Ryan Howard (658), Albert Pujols (788), Adam Dunn (822) and Alex Rodriguez (826) ... in that same game hit another home run, giving him his ﬁ rst career 40-homer season. Was named Brewers Player of the Month for April (.294, 7hr, 17rbi), June (.319, 8hr, 19rbi) and August (.312, 8hr, 22rbi). Hit safely in 18 of his last 20 games, batting .390 (30-77, 3hr, 12rbi), to raise his average from .309 to his season-ending .319. Was selected to the United States provisional roster for the 2013 World Baseball Classic. Batted .304 with 25 HR, 103 RBI and 14 stolen bases in 157 games...Made 154 starts (153g in LF, 1g at DH)...Earned his third consecutive Silver Slugger Award, joining Cecil Cooper (1980-82) as the onlyplayers in franchise history to earn the honor in three straight seasons...Led the National League in multi-hit games (60) for the second consecutive season...Also ranked among the National League leaders hits (2nd, 188), doubles (T2nd, 45), totalbases (5th, 310), runs (6th, 101), extra-base hits (7th, 71), RBI (T7th, 103) and batting average(9th, .304)...Batted .336 on the road (111-for-330), which trailed only the Reds' Joey Votto (.349) for theNational League lead...Was selected to his third All-Star Game.....became the first player in franchise history to startin three consecutive All-Star Games as he led National League outfielders in votes (2,972,525)for the third straight year.....started in left field and went 0-for-2...Became the first player in franchise history to hit 20+ homers in each of his first four seasons...Has 128 HR through his first four seasons, which ranks eighth in Major League history throughthat many seasons...Joined Cecil Cooper (1982-83) as the only players in franchise history to produce consecutive100-run, 100-RBI seasons...Joined Richie Sexson (2001-03) and Prince Fielder (2007-09) as the only players in franchisehistory with three straight 100-RBI seasons...His 45 doubles marked a career high and tied for sixth in franchise history in a single season...Named Brewers Player of the Month for April (.355, 5hr, 20rbi) and August (.424, 3hr, 16rbi)...Was named National League Player of the Week for 8/2-8/8 after batting .538 (14-for-26) with4 RBI and 8 runs scored...His .424 batting average in August marked the third-highest in franchise history in a calendarmonth, trailing Paul Molitor (.476, September 1989) and Ben Oglivie (.432, September 1979)...Batted .364 (76-209, 9hr, 39rbi) over his last 55 games (beginning 7/31), raising his battingaverage from .273 to his season-ending .304...Smacked his third career grand slam (Joe Saunders) in a 12-2 win on 6/14 at LA of Anaheim...Notched his second career 5-hit game in an 18-1 win on 8/2 at Chicago-NL...His only 2-homer game of the season came in a 7-1 win on 9/26 vs. Florida (11th career). Batted .320 with 32 HR, 114 RBI and 20 stolen bases in 158 games...made 156 starts, all in left field...Earned his second consecutive Silver Slugger Award...Became just the eighth player in Major League history with at least 100 runs, 100 RBI, 200 hits, 30 HR, 20 SB and a .300 batting average in the same season...Led the National League in hits (203) and multi-hit games (64) and ranked among the league leaders in runs (2nd, 113), RBI (4th, 114), total bases (4th, 350),extra-base hits (4th, 77), batting average (7th, .320), OPS (8th, .937), slugging percentage (9th, .551) and doubles (T9th, 39)...Batted .395 (47-for-119) against left-handed pitching, which trailed only the Mets' David Wright (.416) in the NL...Joined Robin Yount (1982-83) as the only players in franchise history to start consecutive All-Star Games...led National League outfielders with 4,138,559 votes...Went 0-for-2 in the All-Star Game, starting in right field before moving to left in the fifth inning...Has 103 home runs through his first three Major League seasons, which is sixth in the history of baseball behind Albert Pujols (114), Ralph Kiner (114), Eddie Mathews (112), Joe DiMaggio (107) and Mark Teixeira (107)...Joined Albert Pujols as the only players in Major League history to hit 30+ HR in each of his first three seasons...Became the first Brewer to hit 20+ HR in each of his first three seasons...Hit career home run #100 in his 400th game (9/11 at Ari)and became the second-fastest active player to reach that milestone, trailing the Phillies' Ryan Howard (325 G)...Joined Robin Yount (1982) and Paul Molitor (1991) as the only players in franchise history to lead their league in hits...Joined Cecil Cooper (3x), Paul Molitor (2x) and Robin Yount as the only players in franchise history to produce 200 hits in a season...Joined Tommy Harper (1970, 31 HR, 38 SB) as the only players in franchise history to have a 30/20 season...Was named Brewers Player of the Month for April and September/October...Produced three multi-homer games in 2009 and now has 10 multi-homer games for his career (all 2-homergames)...Had his first career 5-hit game on 4/21 at Philadelphia...Named National League Player of the Week for 5/4-5/10...Belted his second career grand slam (Bronson Arroyo) and produced a career-high 6 RBI on 5/6 at Cincinnati...From 6/24-7/5 produced a career-high 12-game hittingstreak, batting .373 (19-for-51) with 1 HR and 8 RBI...Recorded career hit #500 with a single off Felipe Paulino on 9/20 vs. Houston...Belted a 2-run walkoff homer off Tyler Walker in the ninthinning on 9/26 vs. Philadelphia, giving the Brewers a 7-5 victory...was the second walkoff homer of his career...Participated in his first World Baseball Classic and batted .381 (8-for-21) with 1 HR and 2 RBI in 6 games. Batted .285 with 37 HR, 106 RBI and 14 stolen bases in 151 games...made 149 starts (148g in LF, 1g at DH)...Finished third in National League MVP voting behind the Cardinals' Albert Pujols and Phillies' Ryan Howard...Earned his first Silver Slugger Award...Was among the NL leaders in extra-base hits (1st, 83), total bases (2nd, 338), home runs (T4th, 37), slugging percentage (5th, .553), triples (T6th, 7), multi-hit games(T8th, 50) and RBI (T9th, 106)...Moved from third base to left field for the 2008 season and did not commit an error...also had 9 outfieldassists...he had previously never played in the outfield in his professional career...On 5/15 signed a contract with the Brewers that runsthrough the 2015 season...is the longest contract in franchise history...Was named an All-Star starter with 3,835,890 votes...he trailed only the Phillies' Chase Utley (3,889,602) inNational League voting...he became the first Brewers outfielder to be voted into the All-Star Game by the fans...Participated in the State Farm Home Run Derby at Yankee Stadium during All-Star festivities...his agent, Nez Balelo, pitched to him...hit 14 homers in two rounds...Became just the second player in Major League history(Albert Pujols) to hit 30 or more home runs in each of his first two seasons...His 71 career homers tied Albert Pujols for the fourth most after two seasons in Major League history, trailing only Hall of Famers Joe DiMaggio (75), Ralph Kiner (74) and Eddie Mathews (72)...Had 8 home runs in 8 games from 5/11-5/18, the firstplayer in franchise history to accomplish the feat...Produced four 2-homer games: 5/11 vs. St. Louis, 5/12 vs. St. Louis, 5/18 at Boston and 6/17 at Toronto...On 5/13 vs. Los Angeles became the first player in Major League history with at least 40 doubles and 40 home runs within a year of his Major League debut...Was the second-fastest player in Major League history to reach 50 career home runs (171g)...Mark McGwire isthe only player to reach 50 homers faster (161 G)...Was named National League Player of the Month for July (.366, 9 HR, 23 RBI)...Belted a walk-off grand slam on 9/25 vs. Pittsburgh offJesse Chavez to give the Brewers a 5-1, 10-inningwin.....was his first career walk-off homer and grand slam...His final home run of the season on 9/28 vs. Chicago-NL sent the Brewers to the playoffs as he belted a 2-run shot off Bob Howry to snap a 1-1 tie in the eighth inning...theBrewers went on to win 3-1 and clinch the Wild Card. Following the 2005 season was rated by Baseball America as Brewers Best Minor League Hitter for Average and thefifth-best prospect in the South Atlantic League...Entered the 2006 season as the third-best prospect in the Brewers organization according to Baseball America...Was named 2006 Brewers Minor League Player of the Year as he batted .289 with 22 HR, 77 RBI and 26 stolen basesin 118 games between Class-A Brevard County and Double-A Huntsville...Was a 2006 Florida State League All-Star and participated in the All-Star Futures Game in Pittsburgh.....following theseason was named the sixth-best prospect in the Southern League according to Baseball America...Following the 2006 season played for the Scottsdale Scorpions of the Arizona Fall League, where he was named to theAll-Prospect Team, batting .326 with 6 HR, 25 RBI and 4 stolen bases in 25 games.....ranked among the AFL leadersin doubles (T1st, 9), extra-base hits (T1st, 16), slugging percentage (2nd, .641), home runs (T2nd) and RBI (T3rd). In his first professional season batted .352 with 10 HR, 45 RBI and4 stolen bases in 47 games between Rookie Helena and Class-AWest Virginia...Made his professional debut on 6/26 vs. Great Falls, going 2-for-4with 2 RBI and a stolen base...Following the season was rated by Baseball America as BrewersBest Minor League Hitter for Average and the fifth-best prospect inthe South Atlantic League. 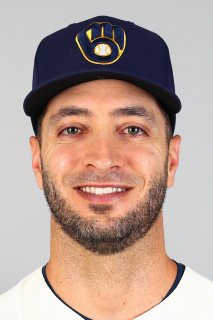 July 21, 2018 Milwaukee Brewers activated LF Ryan Braun from the 10-day injured list. July 8, 2018 Milwaukee Brewers placed LF Ryan Braun on the 10-day disabled list. Back strain. May 24, 2018 Milwaukee Brewers activated LF Ryan Braun from the 10-day disabled list. May 17, 2018 Milwaukee Brewers placed LF Ryan Braun on the 10-day disabled list retroactive to May 14, 2018. Middle back tightness. June 27, 2017 Milwaukee Brewers activated LF Ryan Braun from the 10-day disabled list. June 22, 2017 Milwaukee Brewers sent LF Ryan Braun on a rehab assignment to Wisconsin Timber Rattlers. May 26, 2017 Milwaukee Brewers placed LF Ryan Braun on the 10-day disabled list. Left calf strain. May 21, 2017 Milwaukee Brewers activated LF Ryan Braun from the 10-day disabled list. May 12, 2017 Milwaukee Brewers placed LF Ryan Braun on the 10-day disabled list retroactive to May 11, 2017. Left calf strain. May 13, 2014 Milwaukee Brewers activated LF Ryan Braun from the 15-day disabled list. October 31, 2013 Milwaukee Brewers activated RF Ryan Braun from the restricted list. July 22, 2013 Milwaukee Brewers placed LF Ryan Braun on the restricted list. July 16, 2013 Milwaukee Brewers activated LF Ryan Braun from the bereavement list. July 11, 2013 Milwaukee Brewers placed LF Ryan Braun on the bereavement list. July 8, 2013 Milwaukee Brewers activated LF Ryan Braun from the 15-day disabled list. July 8, 2013 Ryan Braun roster status changed by Milwaukee Brewers. June 15, 2013 Milwaukee Brewers placed LF Ryan Braun on the 15-day disabled list retroactive to June 10, 2013. Inflamed nerve in his right hand. June 10, 2013 Ryan Braun roster status changed by Milwaukee Brewers.